Arns Winery sits on 180 acres with only 10 planted acres of 100% Cabernet Sauvignon. The property is just below Howell Mountain. We are the third owners of this property homesteaded in 1868. The vines are 35 to 50 years of age. This barrel selection comes from our oldest vines and is the spine of Arns Estate Grown. This one-acre block is a unique clone that was selected in the early 1960s. The flavors are not classic for Napa Valley, but very Bordeaux in style. This site produces rich, black chocolate flavors with overtones of mint, coffee and black tea. Aging for 10 to 12 years plus is not unusual. This will be the only bottling of this block of vines. I have been making wine since the early 1970s. 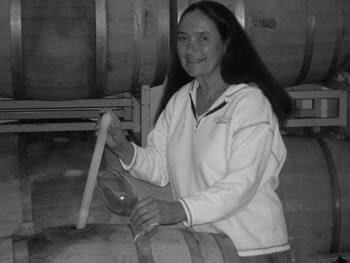 My longest time at one winery was winemaker at Long Vineyards, producing white, reds and dessert rieslings. I have worked in Italy, Australia, China, and southeast. Asia. We started Arns in the late 1980s. I consult for several small producers locally. My thoughts of winemaking comes from a deep love of the vines.Agro business is so facinating because we can not live without it. Manipulating agriculture gives us food and wine that gives us life that is vital to all. A: I chose to make this wine from this particular vineyard because it allows us to showcase a very special site that is isolated from other parts of the Valley as well as the unique characteristics of an old clone.